First, I want to thank MGS for this amazing opportunity to take part in this review! Hello fellow Spies! For those of you who do not know me, my name is Mike. I live in Indiana where my amazing wife of 6 years and I bought our first house this year. I have been playing golf for a little over 5 years now. It all started when I was a year out of college and my boss suggested that I go to the course with him. Knowing that I wasn’t Happy Gilmore and could rely on my 20+ years of hockey experience, I quickly took lessons to get up to speed so I could be somewhat competitive with him. Most importantly, not be embarrassing in front of my boss. It didn’t take long before I became completely hooked and dove in head first to everything golf, which lead me to MGS. My most recent adventure was spending a full week out at the LPGA event that was held here a few months ago. 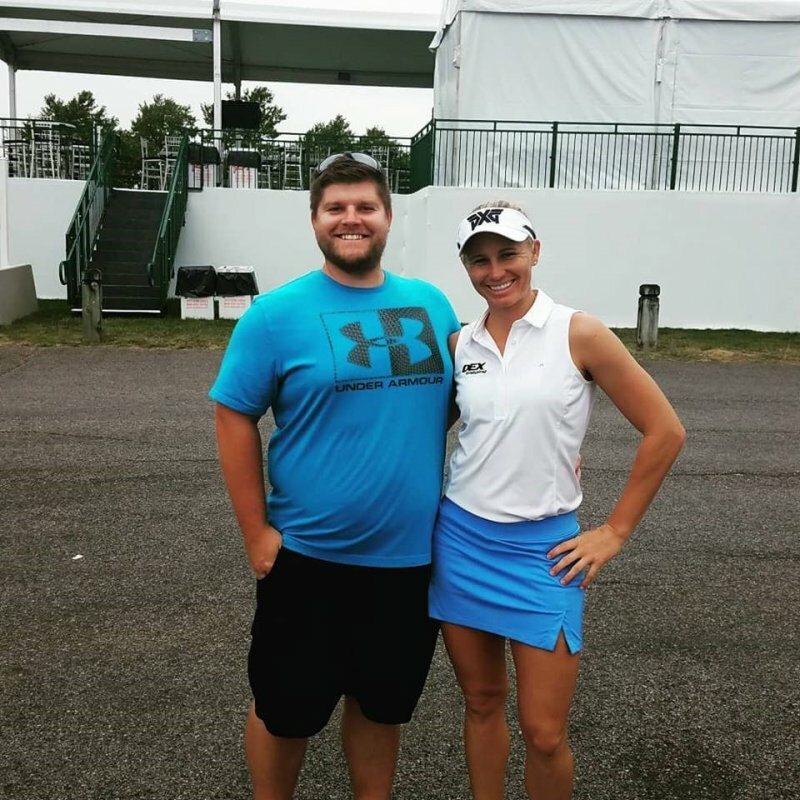 There, I was able to meet my favorite LPGA player, Ryann O’Toole! Some of you may remember me from Martin Chuck’s Tour Striker Golf Academy. As you can imagine, or may have read, I have gone through major swing changes within the past year. With those swing changes, I have felt my driver confidence slipping. I just haven’t been able to find the fairways like I used to and wondered if I needed to go back through a fitting to get everything set for my new swing. This test came at the perfect time! I am currently gaming the Ping G LST driver at 10.5* with the Tour 65X shaft. I was fitted at a local pro shop that has done all of the fittings for every club in my bag. The way I go about selecting a driver, or any club, is to hit as many as I possible to narrow it down to 3. The pro shop allows people to take them onto their range to be able to watch the ball flight. I’m not just hitting into a simulator and relying on the numbers. When I was going through the process to find my current driver, it came down to 2, Ping G LST and Cobra F7+. I hit these multiple times and always found these to be my best performing clubs. Ultimately, the Ping was more consistent with close to the same yardage. I do not carry an official handicap to reference for this test. 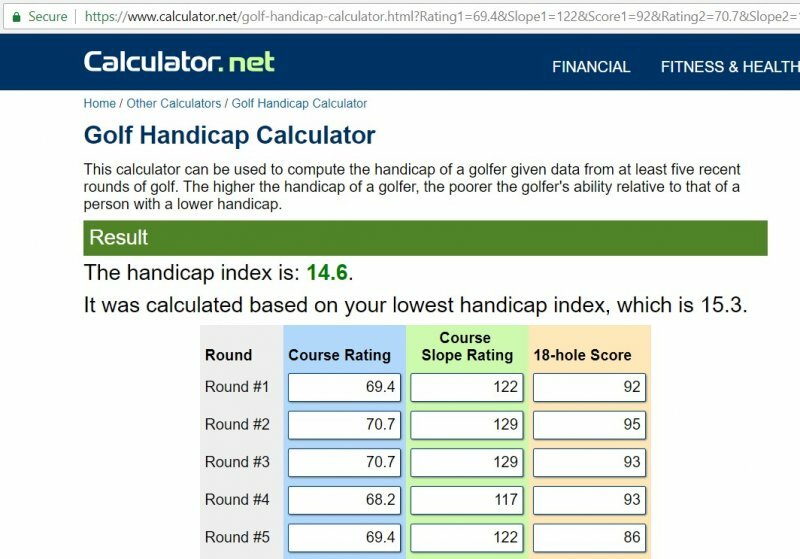 To get a baseline, I entered my last 5 rounds into a calculator to help me determine my handicap. There are a few other rounds where I carded an 86 and 90, but I couldn’t find the course rating or slope. Taking that into consideration, I rounded down to 14 for this test. To get the other three inputs, I relied on the last time I was on a launch monitor. It was about 2-3 months ago at a Titleist Thursday event trying out their 917 lineup right before the TS launch. They were using a Trackman to fit me and recorded my swing speed at 109 mph. I did not pay close attention to angle of attack, but I do know I hit up on the ball. The last parameter for TGF is swing tempo. I have always known that I had a very quick transition. That is one of the main reasons I went for the X-flex in my Ping. I actually went through the fitting tool twice. The first time I only used only the categories. With that fitting, I received the Wilson C300. After hearing that a few of the others in the testing group used expert mode, I wanted to see if there was a difference. I only used the expert mode on swing speed since I do not have the exact numbers for angle of attack. By using the expert mode, I received the Srixon Z765. I put in both results to show differences between just using the categories vs. using expert mode. Currently, I average around 285 yards of total distance with my Ping G LST. Just a few weekends ago, I hit a drive 320 yards, so to see 300 yards is not a surprise for me. With that being said, I would not be gaining the 30+ yards as stated in the fitting. The most important number to me is the gain in accuracy. Looking at the different results, I would really stress using the expert mode as much as possible. Nothing against the Wilson C300, but the spin and launch numbers in that fitting are higher than I typically like to see. I normally get my best performance when I keep my spin around 2,000. 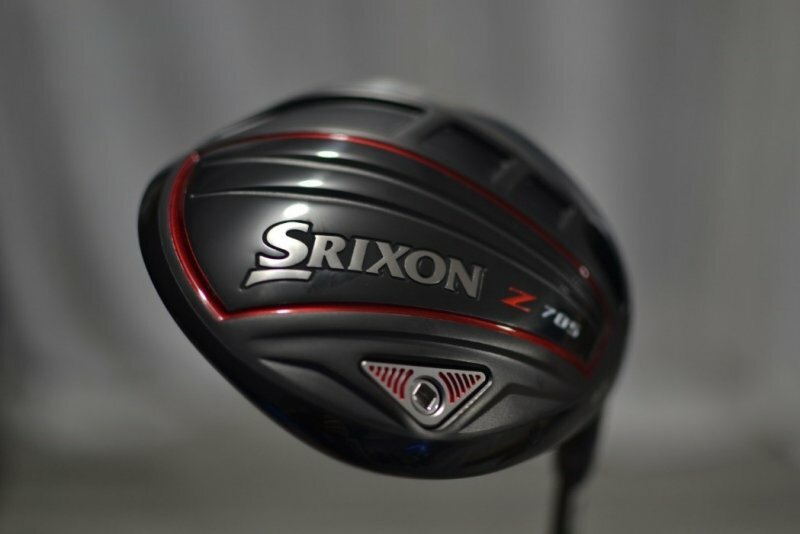 Knowing that, we decided to go with the Srixon driver to complete this review. Some issues with having the Z765 as my best performing driver, is that it is no longer in production. Also, if you look on GlobalGolf’s website, they do not currently test Srixon drivers. Working with GlobalGolf, they are actually adding the Srixon Z785 to their U-Try program. With the Z765 no longer being an option, it was determined to go with the Z785. The concept behind the U-Try program is a great idea. We’ve all wanted to take clubs out onto the golf course to see how they perform before we buy them. Hitting into a simulator is great, but nothing compares to watching the ball flight and how it performs in real life situations. One of the biggest downsides to the U-Try program is the limited number of options for each driver. Going through their website, I noticed there were very few drivers that are X-Stiff. This includes drivers like Callaway Rogue Sub Zero and Cobra F8+, which I would suspect most people trying those drivers would want an extra stiff shaft. The one thing I am uncertain about is if they only have a set number of clubs that will go through this program, and once someone buys that configuration, then it’s gone. With the limited number of options for each driver, I went with a 9.5* head in the only X-flex shaft that they offered, Hand Crafted Project X HZRDUS Black 65. 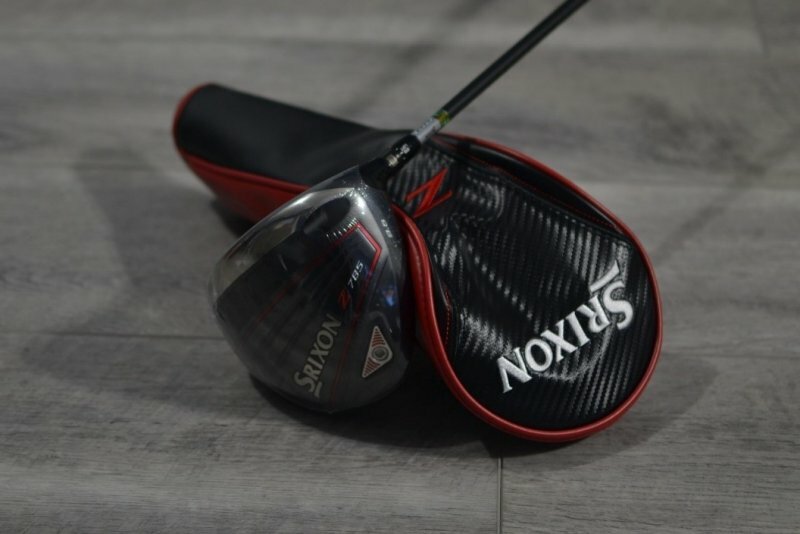 Please note, that if I were purchasing this driver from Srixon, I would most likely be looking at an X-flex shaft around 80 grams. I say that because at the Titleist Thursday event I mentioned earlier that through all of my swing changes, it was determined that I am not overpowering my current shaft. Looking at Srixon’s website regarding the shaft options for this driver, I would lean towards the Atmos Tour Spec 7 Black X-flex. Now that we have the driver picked out, we just need to order it. Here is where we experienced the delays in doing this review. To be fair, this definitely is not the normal process for someone ordering a product from the U-Try program. However, there were multiple issues with MGS trying to connecting with someone at the company to get the test underway. During all of the delays, we found out that someone using the U-Try program would have a hold placed on their card for the full amount of the club. They do not just charge the $25 and wait until the two weeks are up to charge the full amount if they don’t receive the club. We are uncertain if they refund you $25 dollars less upon the return of the club, or how they charge the $25. Once all the logistical issues were worked out thanks to the hard work of the MGS staff, the shipping of the driver was great! There were only 3 days between when I received my shipment notification and the delivery. It came via USPS priority shipping complete with a tracking number. One of my main questions around this program before we started this review was around the quality of the driver. I wasn’t sure with this program, if I would be receiving a “demo” driver that has already been hit, or if it would be brand new. If I was trying this driver to potential purchase outright after the 14 days, I would not want to pay full price for a driver that has already been hit by someone else. Also, would I receive a headcover and tool with the club? My questions were soon answered. As you can tell, the plastic was still on the driver head except for the closeup photo. I also received a headcover and tool right inside the packaging. Welcome back for Stage 2! With the driver out of the box, that meant it was time to go to work. The trouble with being in Indiana is that we are in the beginning stages of winter right now. This was going to limit any amount of testing that I could perform outside. To combat that, the majority of my testing was done on the launch monitors at my local PGA Superstore. This was great because it allowed me to get actual data on every hit to present for my results. The shape of the Z785 took a bit for me to get used to. As you might be able to see from the pictures in my Stage 1, the back of the driver is pulled back to try and get the weight as far back as possible. It doesn’t have your typical rounded shape. After a few hits, I the shape became normal for me. Aside from the elongated shape, the top of the crown is carbon. This is nothing new compared to the other drivers out there. As you look down at address the carbon pattern comes through very clearly. On the bottom of the club, The Srixon is beautifully done. It follows the lines of the club and just looks classy. The bottom of the club was just cleaned up a bit more from the Z765. The overall look of the Z785 is very modern. The one downside I will say about this club is the top. The top does have a higher gloss, so the reflection is quite strong for me. In the sun there was a bit of glare that was coming off the top. I was glad that Srixon added in an alignment aid to this driver. In the past I felt like it was missing that touch. The alignment aid is very minimal, but just enough to let you know you’re squaring the ball up in the middle at address. The sound for me is much better than the G LST. Of course, anything will be quitter than my Ping. The sound isn’t dead, but it’s just enough of a good sound to say it’s bringing power and speed to the table. Here’s a clip of me swinging at the PGA SS to hear the sound. Please note that this is indoors, so it’s slightly amplified. 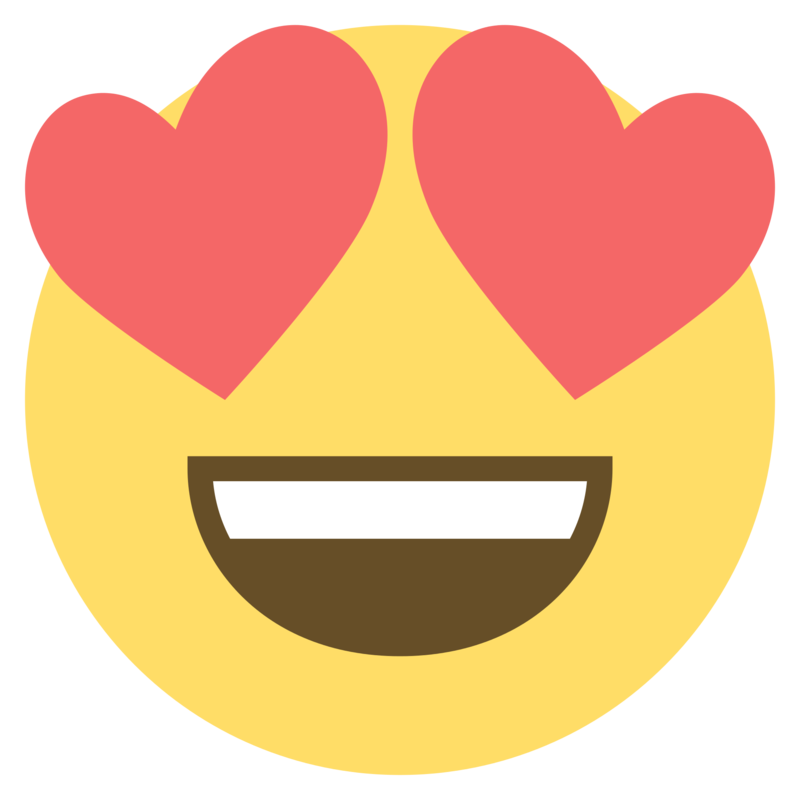 The feel is extremely good! Srixon really worked on the face and it comes through on the feel of this driver. Off centered hits didn’t feel punishing or harsh either. You knew you hit if off the toe or heel, but it was nothing where you would cringe when it happened. During my range testing, I was able to get real numbers from the PGA SS launch monitors, and they also allowed me to throw a few different shafts in the Z785 to assist with the testing. Then to confirm the launch monitor numbers, I headed over to do some outdoor sessions. Not saying that I don’t trust the launch monitor numbers, but I always like the saying “trust but verify.” Plus, to me, nothing compares to being able to see the flight. To do that, there are only a few ranges around here that have heated stalls that allow you to hit out of when the grass range is closed. When evaluating a driver, the most important attribute for me is accuracy. As you may have already seen up to this point, accuracy has been a struggle with this club. I think some of it has to do with the shaft that’s in it. When I tested a heavier shaft, it did bring the accuracy up a bit. It still wasn’t as accurate as my Ping. While this club may not be the most accurate for me, it did win the longest drive. When I put the Tensei Orange shaft in it, it cranked out a few drives over 300 yards. The longest drive was 19 yards farther than my longest drive with my Ping in its playing setup. I will note however, on average, the Z785 only beat out the G LST with the Tensei Orange shaft. The setup that came from Global Golf did NOT beat out the G LST on distance. Part of those long drives were attributed to increased ball speeds. I also noticed the distance and ball speeds stayed up even on mishits. The other part of those long drives was the trajectory. The Z785 was launching higher than I would typically like to see. Being that a lot of the courses I play have a decent amount of open areas affected by wind, I normally like to keep my flight down. I did have this driver at the lowest possible setting, 8.5*, to try and bring that flight down a little. The Z785 has multiple settings in terms of adjustability. +-1* and the ability to make it more upright. I will say that if you forget/lose your wrench that you cannot use another brands wrench. Srixon has gone with square design. With Srixon not being one of the more popular brands on the market, if you forget your wrench at home, most likely you’ll be playing that setting for the rest of the day. Unfortunately, I was not able to get out on the course to test this driver. With snow covering the ground a few days ago, the courses have closed for the season. I would imagine that I would have seen the same results that I was seeing on the launch monitors and the range sessions. To be honest, the performance I have been seeing with this club, I’d be very nervous to take it out on the course. I would expect to only find 1 or 2 fairways with the rest being well off the beaten path, or even OB. Since I was not able to get out onto the course, I will exclude the amount from the grand total. Play it or Trade it? As you might have guessed, I would trade this driver. This isn’t to say the I think the Z785 is a bad driver. I did see an increase in distance, but in its current setup, it just isn’t accurate for me. While it is producing more distance, I wouldn’t be able to keep it in the short grass. I think the restrictions from Global Golf really hurt this driver from preforming its best. As I mentioned in my stage 1, this wouldn’t have been the shaft I would have chose if I were to order this driver from Srixon. I did like the feel of the Tensei Orange shaft in this driver, however the accuracy still wasn’t up to that of the G LST. 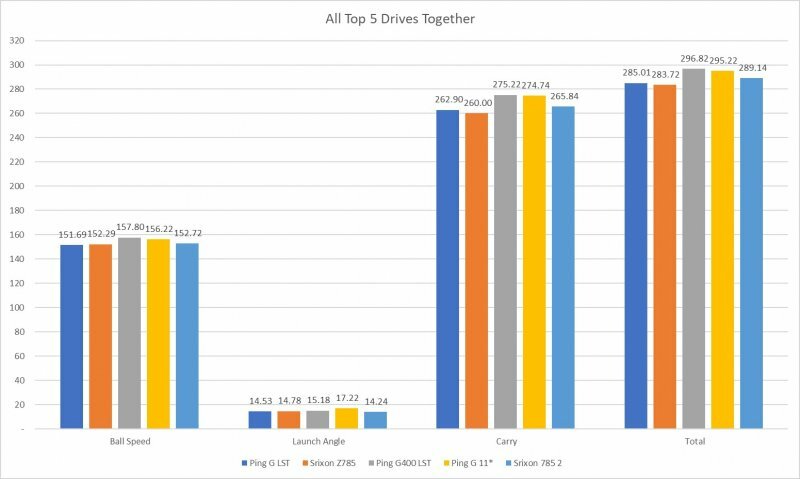 More interestingly, when I compared the Z785 to the Ping G400 LST, the averages of the G400 LST beat out the averages of the Z785, even with the Tensei Orange shaft. All in all, I would like to thank MGS again for this amazing opportunity! While the Srixon Z785 did beat my Ping G LST in distance, it wasn’t able to get anywhere near the accuracy. For me, short grass trumps distance every day of the week. First off, I would like to give a big THANK YOU to MGS putting this together and another thank you to CG2 for dealing Global Golf and putting up with me in the PM thread. Well, y'all know me as GB13 but others may know me as Grayson. As most of y'all know, I am 15 years old. I played my first round when I was about 5 years old and have been hooked ever since. I have lived in Minnesota for all of my life and hopefully will be heading south soon. Golf is a perfect game for me to be addicted to. Since I am a perfectionist, it gives me a constant challenge to be better. There is NO perfecting golf. I love trying to improve and "perfect" what I can. I am also super competitive and golf gives me a place where I can appropriately channel that competitiveness. It allows me to be competitive with myself or with others. I can always try to beat my low score, hit 8 fairways etc. I would describe myself as an avid golfer. I play upwards of 70 rounds a year with range time on the days I don't play a round. My goal is to play golf in college and maybe even play professionally. Honestly, it probably won't happen, but hey, we can all dream, right? If you asked me to describe my game in one word, it would be: inconsistent. I currently play off a dropping 4 handicap. If you play with me twice, one day I'd shoot 71 and you'd say I was a sandbagger and the next day I'd shoot 84 and you'd say I have a glory handicap. For me, my scoring goes back to my driving. I have a really solid approach, chipping, and putting game. It all boils down to how I played off the tee. If I hit fairways I score well, if I don't, I score poorly, it is that simple. I am not happy with my current driver. The only reason I purchased it was because it was deeply discounted. I wasn't fit for it and I didn't really know what a fitting was when I purchased it. My driver was the next thing on the hot seat before I got picked for this testing. My driver swing speed is 108mph and I have a fairly quick tempo. A 48 gram made-for pool noodle does NOT work for my swing. When on a Launch Monitor, my spin numbers are over 3,500 RPM so I have a ballooning ball flight with the driver. I also have a sneaking suspicion that if I put my driver on a loft machine, it would be much higher lofted than the stated loft. Due to my spin numbers being so high, I am a very inaccurate driver and don't get the distance I should with my swing speed. My average distance is around 250 with great shots going 280+. Averaging out my rounds this year, I hit 5.2/14 fairways. I miss slightly more frequently to the right but the two way miss is still very much in play. I usually try to play a fairly straight ball that falls a yard to the right. I have developed that shot after reading a MGS blog article that said, "missing fairways to the left are 0.2 strokes more penal". Therefore, I play to have a right miss. Now, with the background information out of the way, we can move on to the fun parts. (Read the following in your best informercial pitch voice) You can gain 15 yards and hit 10% more fairways instantly!!! But wait there's more, it's only $7!!! That's what True Golf Fit (TGF) promises. Is it for real? We're going to find out. The entire experience with TGF went about as smooth as butter. We were able to go through the TGF process the day after the testers were announced. Creating an account is as simple as your email and a password. NO tricks, NO unwarranted requests for personal information, NO gimmicks. Expert mode gives you the option to put in your exact swing metrics if you have them. e.g. 108 Swing Speed and +1.5 AOA instead of Medium Fast and Up. In theory this gives you a more personalized and specialized fitting. For each question, there is a nifty 30 second video of Adam explaining each question and defining the answers. One quick critique here, I wish the videos told you how to figure out each swing metric, as opposed just explaining the definitions. While the AOA and Tempo videos do a great job of describing what AOA and Tempo is, they don't describe how to measure your AOA or Tempo. While I didn't get these verified by a launch monitor, I am fairly certain these numbers are accurate. I was able to use a few charts for my swing speed. I was also able to extrapolate my AOA and Tempo from a few slow-mo videos. I was really surprised when I got my results. I had never considered either of those 2 drivers. Honestly, if I took a blind guess, I would have picked the M3 or G400 LST. I knew I needed lower spin and was a decent ball striker. I had never really considered Wilson Staff drivers. I always thought they lagged behind other drivers in technology. When I hear Wilson Staff, I think great player's irons not cutting edge drivers. I also found it interesting that based on Tony's Most Forgiving Driver article, the two drivers it recommended were the MOST and LEAST forgiving drivers. Also looking at the COG charts that Tony provides the Ping and Wilson Staff are wildly different. The PING is low and back while the C300 is high and forward. It seems interesting that 2 vastly different drivers can be the best performing for one person. Personally, I love the concept of TGF. The idea that you can have a reasonable idea of the best performing golf club after 4 simple questions is revolutionary. TGF does a great job of removing any bias that you might take into a traditional fitting. If I went into a fitting thinking that the C300 lagged behind in technology, I wouldn't want to hit it as well as a driver I thought was a good fit and that could very easily skew the results. As time passes, it would be great to see lofts or maybe even shafts added. It doesn't have to be all of the 10,000 custom aftermarket combinations, just which stock shaft and flex is the best. I know Adam doesn't want to add them yet because he doesn't have a large enough sample size and I respect that. It certainly shows his dedication to the consumer. All in all, I think TGF is a great service that is still in its infancy. It will be interesting to watch TGF grow throughout the next few years. I certainly believe that TGF could be THE next big step in fitting technology. So far, my early results are extremely promising. Well, if the TGF experience went as smooth as butter, the Global Golf U-Try experience went about as smooth as a rocky mountainside. I'll get into that later. In theory, the U-Try program is good for the consumer, and good for Global Golf. For the consumer, it gives them a chance to try any club for 14 days in real on course situations for $25, before they decide to shell out their hard earned cash. If you like it, keep it, they'll charge you for the full purchase price. If you don't, send it back and you only pay for the trial. For Global Golf, if you keep it, they sell a club to a client who might normally go to Golf Galaxy. If you send it back, they can sell it in top of the line used condition for $50 off, but let's be honest, we are all golfers, how many send back a shiny, new toy. After we completed the TGF process we ran into some *difficulties* with Global Golf. It took about a month and way too much of CG2's time to coerce Global Golf to ship out our clubs without us giving them a credit card number. While we didn't have a traditional ordering process with Global Golf, we did find out that instead of charging you $25, they put a hold on your card for the full purchase price. Then if you send the club back, they'll refund your card the full purchase price minus the $25. I understand why they have this practice in place, but it makes Global Golf's advertisements seem a little misleading. In all fairness, this is a unique situation that Global Golf doesn't deal with all the time, but if this is how their customer service treats people REVIEWING their company, I doubt they treat regular customers well. Again, with a regular ordering process, you may not have to deal with customer service, but if you have something go wrong in the ordering process, I wouldn't trust Global Golf to rectify the situation. One other critique, the shaft selections are very limited. While Global Golf has a plentiful array of heads, for the C300, the only shaft options were a Fujikura Speeder Pro 58 Senior or Stiff flex. I do think as their business/U-Try program grows they will be adding more shafts. Now that we have covered the issues, the clubs Global Golf shipped were brand new, in plastic, complete with tool and headcover. I was actually impressed with the promptness of delivery and the club being complete. It looked what like you would buy directly from Wilson. Overall, the U-Try program is a great idea. I think that with improved customer service and greater club selection Global Golf could have a real home run. However, even if they have the exact club you wanted, without adequate customer service, I would most likely advise you to hold off on the U-Try program. I know this seems like a very negative review of Global Golf but I am just trying to give y'all my honest opinion. I really appreciate MGS giving us a place where we can be honest during our reviews. This is my first review for MGS so if anyone has any feedback, please let me know. Also, if you have anything you specifically want me to test, just let me know and I will do my best. We will be giving updates as we progress in the review process so check back frequently for updates. Welcome back! I'd again like to thank My Golf Spy for this wonderful opportunity. Unfortunately due to the delays with Global Golf, and the sudden onset of winter , my testing was cut a little short. However, I still managed to get in 4 range sessions and 4 rounds. Plus, I was able to get some solid LM data to back up what I was seeing. So overall, I may not have gotten to test it outside as much as I normally would, however I still have a very good idea of performance. When you look at the C300, the first thing you notice is that its RED! Wilson says the red is simply to make the consumer pick the club up off the rack. It certainly makes you look at it. Whether you like it or not is a personal preference. Even though the red is bold, Wilson really put a lot of effort into making a nice finish. The red is a deep, matte color, so it doesn't reflect the sunlight like I was concerned it would. While I can tolerate the red, it isn't my favorite, and I could definitely see this being a turn-off for some people. One other obvious feature at address is the Power Holes. Wilson says the Power Holes, "Generate greater ball speeds, longer distances, and a more consistent performance, round after round". In my opinion, they really threw off the look at address. They seemed disruptive to the smooth red finish and instead of being level with the crown, the urethane filling was recessed into the body. Frankly, they just bug me. Since they were already recessed, I don't know why Wilson didn't put the crown over top of them and eliminated the distraction. Aside from the red, the C300 has a rather deep face and is fairly narrow from heel to toe. For me, who's miss is high or low on the face, this really inspires more confidence over the ball as opposed to a long and shallow face. The graphics are clean and crisp and really give the driver a polished look. Overall, this is an okay looking driver. It certainly wouldn't be the first one I'd pick up off the rack, but it wouldn't be last either. I do question why Wilson made the C300 red as opposed to the D300. In general the D series irons are red while the C series irons are chrome and black. I also think the red would turn off more lower handicaps than higher handicaps, but I could be wrong. Sound and feel is just about the last I worry about when picking a driver. The sound and feel all happens AFTER I hit the ball so it doesn't affect the my mindset much at all. That said, the sound on flushed swings is really smooth, soft, and just sounds fast. (if that's possible?!) It maintains a little of the metallic sound that older Wilson drivers have, but is nowhere near as overpowering as Wilson's older drivers. Frankly put, the sound on mishits is awful. The farther away from the sweet spots, the sound gets louder and "clunkier". It sounds like I hit a iron ball with a chunk of steel on the end of a piece of telephone cable. It certainly gives you an incentive to not miss the center of the face! Again, the feel on flushed swings is really smooth and soft. The Fujikura Pro shaft Wilson has paired with the C300 really accentuates the smooth feeling. Coming from a driver that is very crisp and firm, the C300 is a nice change of pace. Likewise, the feel on off center hits is terrible. It feels really clunky and hard. My guess is that the Power Holes make it feel harder away from the sweet spot and if I didn't get the results I'll touch on later, I'd want them removed. 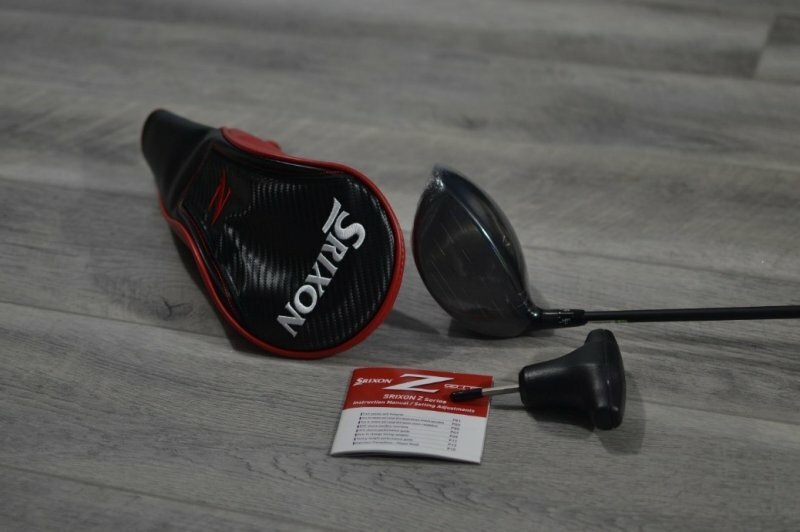 Based on sound and feel alone, this driver has the largest, most abrupt change, from flushed and smooth, to clunky and hard. The sound and feel makes the sweet spot feel very small and doesn't inspire confidence. As I mentioned earlier, I was able to get in 4 range sessions and a few trips to an LM. My range protocol was to hit 5 draws and then 5 fades then 5 draws and so on, toward the 250 target. I'll briefly touch on my performance with my current driver (Taylormade Aeroburner) and then get into the performance of the C300. When I do this drill with my current gamer, on a flushed shot, I carry it 240 and get roll out to the 250 target. This is clearly not ideal for my swing speed. The number one culprit here is spin and trajectory. My current trajectory is high and ballooning. Due to the lack of any adjustability, I can try to deloft my driver, and have no avenue to fix the trajectory. I have always struggled with this driver, and can usually hit 4 of 10 in a fairway sized swath with the target in the center. I find my current driver to be very unforgiving, I'll lose 20 yards on a tiny mishit. I really don't have any control over my current driver, I can hit what feel like 2 identical shots, and one will cut 20 yards and the other will draw 20 yards. On my first swing with the C300, I carried with a nice baby cut past the 250 target and ended up at about 280 with roll! I pretty much had to pick up my jaw off the ground, I have never gotten my (now former) driver to carry that far... ever! Next swing, I caught it a little thin, but got a low bullet that carried way farther than it should have and ended up about 10 yards right and short of the target. Over the course of my 4 range sessions, I continued to see flushed shots carry about 260-265 and roll out 275-280. This is much closer to maximized numbers for my swing speed. My trajectory is still high (which I like) but it no longer is ballooning. I also now have the ability to loft up or down (8° to 11°) depending on course conditions and depending on what trajectory I want. Unfortunately I can't notice a difference between the draw and fade settings since the weights are only 2g , 6g, and 6g. This isn't really a feature I'd use to much anyway but I still wish I had some flexibility. Even though I am working on improving my accuracy and control, I still struggle finding fairways. Lowering my spin numbers seems to be helping a little bit with my overcooked fade. (That's my nice way of saying, 110% certifiable banana slice🏌 .) I can now hit about 6 out of 10 in a fairway sized swath around the target, so that's a good improvement. The C300 is way more forgiving than it sounds and feels like. It's really fun to hit a shot that you know wasn't flushed, and then watch it fly like it was flushed. I must say, the Power Holes actually seem to keep the ball speed up on off center hits. I really thought the Power Holes were more marketing snake oil, but they seem to work as advertised... color me surprised! I've never really been able to work the ball intentionally with any driver and that has remained the same with the C300. It isn't a magic stick that magically grants wizarding powers to anyone swinging it. And trust me, I'd need wizarding powers to work the ball intentionally. As I mentioned earlier in the thread, I was able to get solid launch monitor numbers. While the real world results are really only what I care about, I still wanted to get some validation of what I was seeing. I needed cold hard numbers to make sure I wasn't looking at the C300 through rose colored glasses... I wasn't. It doesn't get any more definite than that. 24 yards!! How often can you say that? 24 yards! I really was shocked to see results that definitive. I had no idea that the Aeroburner was that bad of a fit. I'll just say it here, TGF is 100% the real deal. X and T have hit a home run! Unfortunately, winter came quick here and I was only able to put in 4 rounds with the C300 as opposed to the 15-20 I normally would in this time frame. That said, I did track my stats for these rounds and was able to determine how I liked the C300 pretty quickly. I hit one ball with each driver on every hole I could (12 out of 18 holes) in each round and kept track of the results. I alternated which driver I hit first on each tee so I didn't get comfortable with the shot before changing clubs. With the Aeroburner, I hit 16/48 fairways with an average distance of 252. I also had 4 OB and 2 lost in the water. This is pretty average for me, not my best and not my worst. 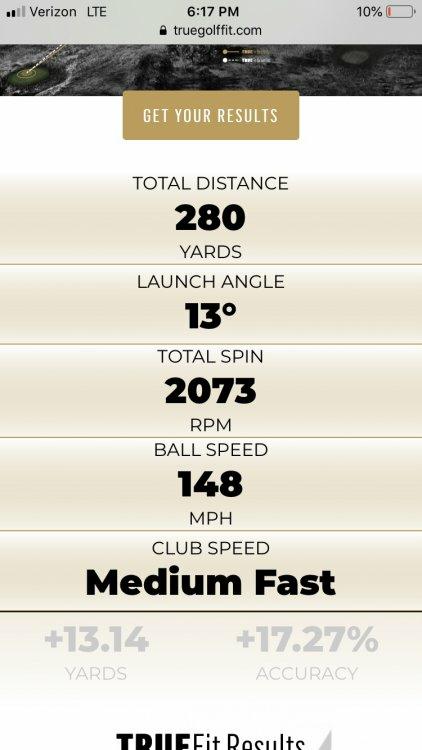 With the C300, I hit 25/48 fairways and average 267. I also had 2 OB and 1 lost in the weeds. Obviously, this isn't as large of an improvement as the LM said. But these are all shots in a round, I'm not counting the best 5 I can hit, I'm looking at how this driver performs when I need it to the most. Really though, 9 more fairways and 15 more yards is astounding and more than I hoped for entering this test. What I saw on course, pretty closely mirrored my results on the range. My trajectory was still high but not ballooning. My accuracy was still user dependent. I couldn't hit any shot shape other than my stock cut, and occasional slice. And this driver is still a heck of a lot more forgiving than it should be. My ball marks on this club are all inside the "grooves" heel to toe with a tendency to be higher than the center line. My mishits (high) were just a little shorter and had more of a tendency to slice. This is most likely due to a steepening of my swing, cause by an over the top move. In other words, problem exists between hand and grip, not club and ball. The 18th hole at my home course, is a straight away par 4 with water on the left and right of a narrow fairway. I always hit 2 or 4 iron off this tee because of my lack of faith with my Aeroburner. While testing, I hit driver off this tee every time. I hit 2 in the water with the Aeroburner and 0 in the water with the C300. Admittedly this is a small sample size, however I have so much more confidence to hit driver in tournaments and pressure situations than I ever did before. Compared to my current gamer, the C300 performed better in every measurable aspect. The only place it fell behind, was in the looks and sound & feel categories. I will gladly take take performance over subjective categories. MGS is #datacratic and what goes into my bag is based on data, not subjective categories. Based on the data those subjective categories have no effect on performance. Wilson has convinced me that they are a leader in driver manufacturing. I used to think Wilson was a pretender in wood technology. They have proven to me that the are a contender who plans to improve their market share. I really think Wilson has turned out a driver that could beat any driver from the big boys. I do think they made it look a little cheaper/juvenile by going with the red finish and would attain a more premium look with a black/gray finish. I'd also like to see the Power Holes covered by the crown. Again, I think that would give the C300 a more premium look. I think Wilson is doing really well performance wise, they just need to work on the subjective properties a little more. It's in my bag for the foreseeable future. I haven't been this confident with a driver before. I can't say enough about the performance gains I have achieved. The only thing that would take it out of the bag is if Wilson could improve the look and sound & feel without compromising the performance. This driver absolutely maximizes my swings potential, therefore it stays in my bag. The Wilson C300 is a great performing driver both in the distance and forgiveness categories. The looks and sound & feel aren't my style. It is staying in my bag for the foreseeable future. TGF is a great fitting tool and helped me find a great driver. Do yourself a favor and at the very least, try out the C300 to see if it works for you. 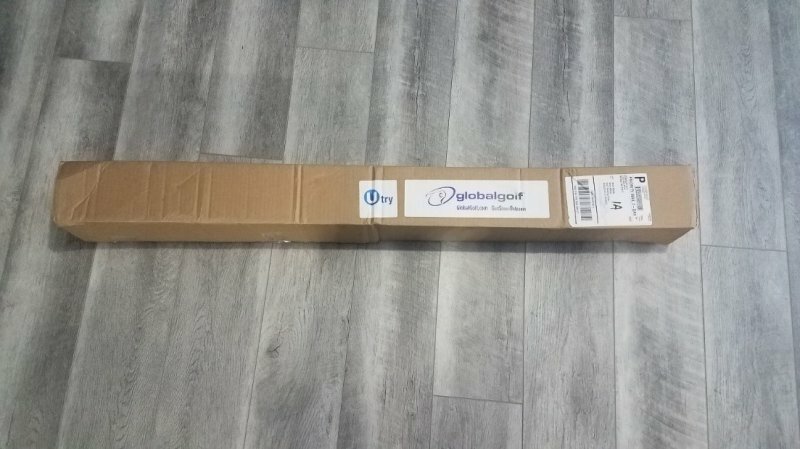 I want to give a shout out to Golfspy_CG2 for his persistence and time in making this finally transpire, MyGolfSpy and Global Golf for giving me this opportunity to find some badly needed distance off the tee. I go by “808nation” originally from Hawaii hence the 808 area code, but go by Allan to my friends so all you good folks can call me by either. I moved to the Northeast about 8 years ago for family and work…do I miss the Islands? Hell yeah, can’t beat the year round hacking for a golf addict like me. I am a self-appointed golf junky; I love everything about the game except for the 6 hour slow rounds…I love looking at and buying new or used equipment, can’t get enough of it. I’ve been playing this game for over 20 years and I still get excited whenever I get a chance to play a round. I try to play at least once a week until the courses close during winter, and then I am off to the driving range. 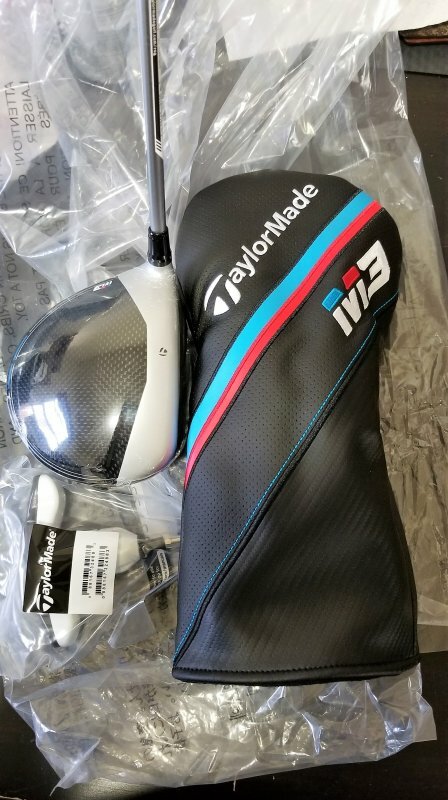 2017 TaylorMade M2 10.5 driver is my current gamer with a white tie shaft in stiff flex at 57 grams. I typically swing around 95 with an average distance of around 220 yards plus or minus 10 yards and primarily keep it in the fairway. I am hoping that this new driver will be able to give me the extra yardage so I don’t have to always use my longer clubs into the greens on longer par 4’s. I chose my WITB based on what appeals to my eyes and my game. Never been fitted for anything except for the Mizuno EZ JPX driver and 3 wood I had the opportunity to review for MGS. Would I like to? Definitely…I just need to make the time (procrastinating there L). Don’t hold an official handicap, but my scores range from mid 80’s to low 90’s, my lowest scores were a 72 and 78…which I still try to duplicate, but have yet to find that same feeling. I found the interface was very user friendly and intuitive. You will be asked to answer a set of four questions (Handicap, Swing Speed, Angle of Attack and Tempo), after you enter your Handicap, the next step is your Swing Speed (here you can either click on a range of speeds from slow to fast) or click on “Expert Mode” to enter your exact Swing Speed. Moving on to Angle of Attack, you have three options (Down, Level and Up) or in “Expert Mode” you can enter your exact number (e.g. -1, 0 or +1), not sure what AoA is, click on the ? mark and watch Adam explain. Lastly, choose your Swing Temple (Smooth, Medium and Quick). TGF will give you performance numbers based on “Swing information with TGF’s database of over 45,000 swings and 10 million data points”. Click on “Get your Results” pay the $7 (no brainer here, skip the Starbucks frappe for one day) and then voila! Like of the many comments I have read so far about True Golf Fit, I too wish it was more detailed with shaft flex, weights positioning, loft information...etc. Hopefully, that will come very soon, cannot wait for that. I was clearly surprised at my results, not so much by the Srixon z565 but with the TaylorMade M3 440 @ 9 degrees loft. 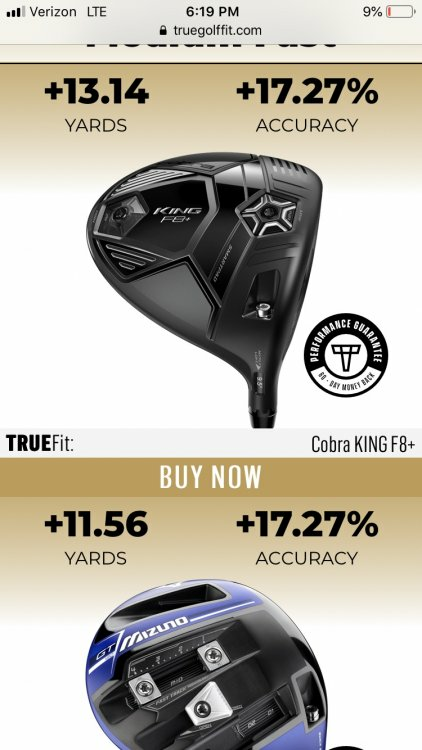 I have never in my life used a 9 degrees driver AND my result recommended a 440 CC driver versus a 460 model which supposedly is the more forgiving of the two. Stay tuned for Stage 2 folks, things will definitely get more interesting as we take our drivers for a test run. There were definitely some logistical issues and some personnel changes at Global Golf which caused things to be dropped and caused delays in getting our drivers. But GolfSpy_CG2 came through for us in the end. 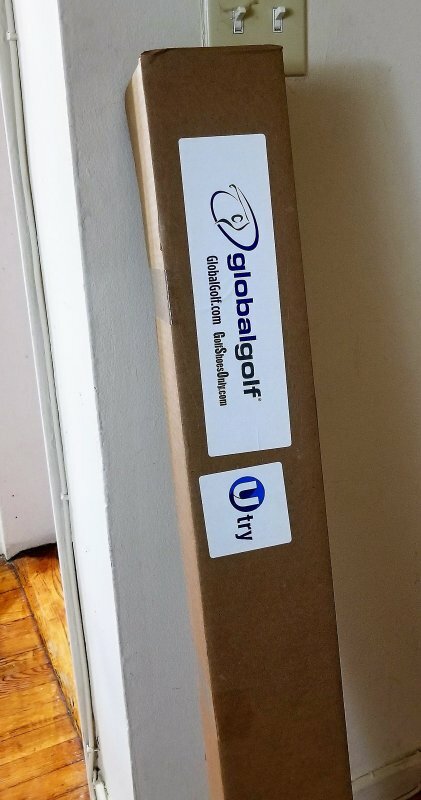 Once everything was confirmed and gave our driver type and configuration to CG2, shipping and receiving was rather quick for me as I received an email showing my driver order was entered on 11/2 and I would receive it on 11/5 (amazingly, I received my box on 11/4 via USPS on a Sunday!?). I received a second email and it was very odd and confusing because it showed that 2 boxes were being shipped, one by FedEx and other box by USPS but they both has the same tracking number. Here’s the link https://www.globalgolf.com/u-try/ if haven’t visited their site yet. The user interface is simple, you choose a driver from a list of 9 and within that particular driver you may have different categories like TaylorMade M3, M3 440, M4…etc. Choose one and click on configure – Now I am not sure how many drivers with different specs they set aside if they do, but I have noticed when I try to check different specs sometimes it is not available. By that I mean some days there would be no regular shafts and some days there would be, not sure want’s going on there. I have noticed very limited shaft flex and loft options, like I mentioned some days there would be more than other days…weird. Lastly, set up an account and MAKE SURE your shipping and billing address is the same because they will cancel your order, it has happened to CG2 and myself. AND, be prepared to have your credit card or debit card authorized for the full purchase amount of the driver held until you return it and have to wait beyond 48 hours to have it released (I learned the hard way when I wanted to try out a fairway wood). If you decide to keep the driver they will deduct the $25 trial fee from the total price. I chose the TaylorMade M3 440 at 9 degrees which was my True Fit Driver and when I went to configure it to give my order to CG2, it only gave me the Mitsubishi Chemical Tensei White 60 shaft as my only option and now as I view their site again, the Tensei Blue 60 showed up so I am not sure if they are having inventory issues or something else going on here. IMHO - Global Golf’s U-try could definitely use some tweaking on their back end, front end or every other end. I love the concept of trying out clubs before purchasing them, but when there are very little few options available for you to choose from, it would definitely turn off some customers. I would consider using this program, if they provided more options and brands. My apologies to my fellow MGS family for the very late second stage. With very limited resources right now (i.e. courses closed for winter, bad weather, temp tees and greens, limited LM access) I have been only able to get in 14 rounds with range sessions as well. The M3 440 driver looks fantastic, the gray and carbon composite crown on top with minimal graphics is a pleasing look to my eyes and when comparing my 2017 M2 driver side by side they both look great. I really liked the smaller footprint of the M3, the only thing that was a turn off for me personally was the deeper face when comparing both the M3 versus the M2 I much rather prefer a shallower face design. I preferred my M2 versus the M3 in this category, the M3 sounded very clunky and much louder than my M2 of course this was depended on where the ball made contact on the face as well. In my observations during testing, it really didn’t matter where I contacted the ball; high, low, toe and heel shots all produced similar sounding sounds which was definitely a big tun off to my ears. The feel part I will explain more in detail during my range and on course performance, but my first thoughts of the M3 was that it was definitely a lot heavier than what I was used to. The fact is the Global Golf’s U-try program had very limited selections as to what shafts were available and I was sort of stuck with a shaft that was 10 grams heavier than I was used to playing normally. During my initial testing phase, I was very hesitant and nor very confident that I could swing this club solidly enough to even match my current distance with my M2. TrueGolfFit recommended the M3 440 driver (a 9 degrees driver at that, unsure if this was a stock picture, so -1 for TGF) never played anything below 10 degrees in my whole golf life. But, with a gain of +25.81 yards and an increase in accuracy of +11.90%, I was extremely excited to see numbers, could this really be true I thought. Knowing that TGF now has shaft recommendations, I will definitely go through it again to see which shaft I am matched for. Before then, I wished that TGF had more details besides what club model (i.e. shaft specs, driver loft and driver length). The M3 gave me extra length (+10 yards) off the tee in 50% percent of my shots off the tee. With the heavier shaft and weights near the face, it gave me more of a boring trajectory and definitely more row versus my M2 driver. And, because of the heavier total weight, sometimes I could not close the face fast enough thus getting results that would balloon to the right like a banana but to surprising not losing too much distance. I loved the option of the adjustability which gave me more options to try a higher trajectory. During course play, I had to get used to the heavier shaft thus making slower smoother swing and that allowed me to contact the middle of the face and get better drives versus trying to swing out of my shoes and not go anywhere. 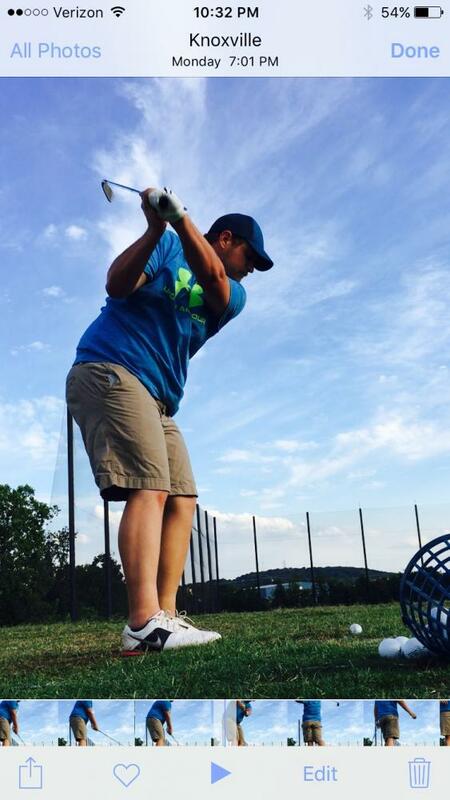 Once I got used to the overall weight, for the most part I was able time my swing to hit more consistent drives. I will try and give more updates when golf season starts back up again. I’ve always enjoyed playing TaylorMade products, they make great clubs, more often than I would like but it does give golfers choices to choose from. 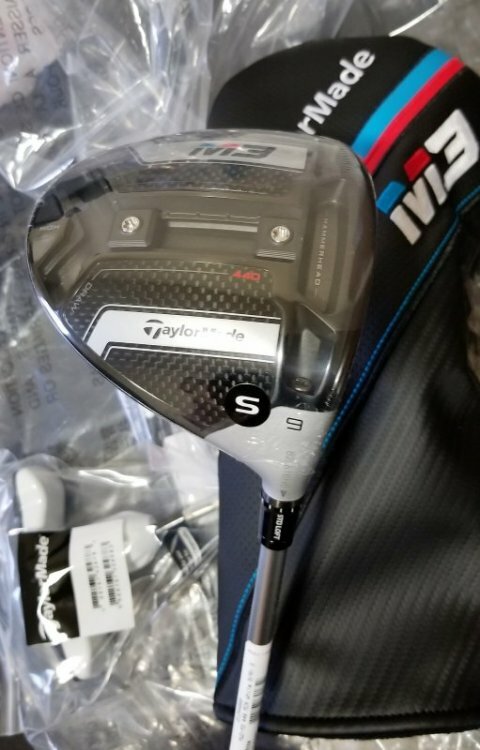 The M3 definitely did perform to my expectations, it did not wow me like I thought I was going to be but trying a lower lofted and heavier weighted driver opened up my eyes and I believe it helped me with my negative angle of attack due to having too much spin with my previous drivers in the past. I will keep it in my bag as long as I can hit consistent longer drives. I am trying to get a lighter shaft and see how that affects the playability and if that changes any numbers for better or worse. 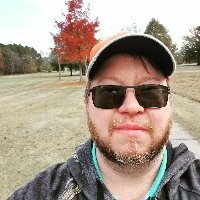 I am having a great time testing a lower spin and lofted driver and trying out a driver out of my comfort zone or from my usual buying guidelines for a driver. Until the U-try program improves to give golfers more options with shafts and drivers, I won’t be testing out drivers on their site. It is a great idea, but being so limited has it being golfer unfriendly. True Golf Fit was great and only can get better with more options such as shaft recommendations, loft, length of driver...etc. You definitely can’t go wrong with it being only $7 to get fit and statistically finding a clone of yourself from mounds of data collected from golfers. I loved doing this testing and will continue update this post with data I get once golf season starts back up. Once again, thank you MGS for allowing me to go out of my comfort zone and play a driver that I would never consider of purchasing and having some good results because of it. Hello, fellow golf spies! I want to thank the Mygolfspy admins and mods, if it weren't for you, I wouldn't be here today...I would be here, but I wouldn't be a tester! my name is Eric and I am from the great state of Tennessee! Literally it is great and its great to be a Tennessee Vol! (now known as a basketball school, formerly a football school). I am 31, married for just over 5 years, high school sweethearts, and now parents to a spunky, adorable, independent 2 year old girl! I have fought with this game for over 20 years now picking it up in middle school officially. I had a family that golf was the lifeblood...remember in the movie “My Cousin Vinny” where Vinny’s girlfriend is on the stand and the state’s lawyer asks her how she is qualified to speak on being a mechanic? She says “my father was a mechanic, my uncle was a mechanic, my two brothers were mechanics…”etc., etc. Well, that's my family except golf, so I was going to start playing golf! I was fortunate to get just good enough at this game to earn a scholarship to play some small town college golf and had a blast doing it. Played pretty well, made a few tournaments, had a top 10, then sorta fizzled out but made some lifelong friends along the way. Fast forward to today and I'm basically a poor man’s Chuck Knoblauch when he couldn't make the throw from 2nd base or when Tiger got the yips chipping...the game is in there and sometimes it shows up but usually I'm just left wondering what is going on with some shots. I'm now a weekend golfer but more like every other weekend to once a month. Still love playing with my dad and I have a few buddies that I enjoy getting on the course with and always try to take a golf trip per year where golf is one of the last things on the mind. Wedges: A-, if I ever have a wedge into a hole with a look a birdie, I'm licking my chops! But typically i have already punched out and I'm just trying to save par. To master a skill it takes repetition and that's why I'm so good with my wedges....sometimes a wedge out from the junk and then wedge again onto the green! It’s science! Irons: B, lots of irons off the tee box for me because you don't get to spend that much time with your buddies when you’re hunting for your ball in the woods or tree all day! Putting: Meh, let's move on. With all that said, I love the game whether it loves me back or not. I quit worrying about score a long time ago, unless i make a birdie or two early, and just enjoy cutting up, getting away, or spending time with buddies or family. The greatest moments I’ve had in life were with my uncle, dad, and grandfather on the course. The Golf Questions - Just wait, the good stuff is coming. Ping G30, X Stiff factory shaft, 9 degree, neutral face setting, Midsize MCC Golf pride Grip (this grip is on all my clubs so I won't bog you down with telling you the grip on each club). Ping G25 3 wood, factory shaft. This 3 wood is a rocket and it has a magical face on it that through magic you can never, ever hit it poorly! Mizuno Fli Hi 3 iron Driving Iron… thank you to a fellow golf spy. and as of today…I don't have a putter! But its ok, my new Odyssey Fang 2 Ball will be here in about a week! All of my clubs come to me through different ways… the driver has been just a bunch of trial and error and there have been a lot of trials and a lot of errors and I am still searching for that magical driver. Once upon a time a long time ago, i walked up to the box, pegged the tee, busted one down the middle and walked off but now today. For the most part there isn't much science to why a choose a club as in no ways am I the next Bryson. I have a little bit of a mindset that I can hit any club so the majority of my clubs I bought new as a last year’s model, got on discount, thought they looked pretty, etc. Nothing high tech or fancy. I had never been fit or had a club worked on until last year. Two years ago when I bought the Ping irons I noticed that every solid shot I hit was off the toe. The ball flight was good, the distance and accuracy were right, but the shot was just barely out on the toe some. I set up a fitting with the local ping rep and while keeping my pings, we adjusted each iron. Side story...The adjustment was SUPPOSED to be 1 degree up and add .5 inch to each iron...a couple months after having them bent a couple started to rattle. I took them into my golf store and they pulled the grips off and checked the loft and lie and started to laugh. Nothing was bent correctly and the extra length that was put on were all different and based on the ping fitters handy work, they could pinpoint who did the work! 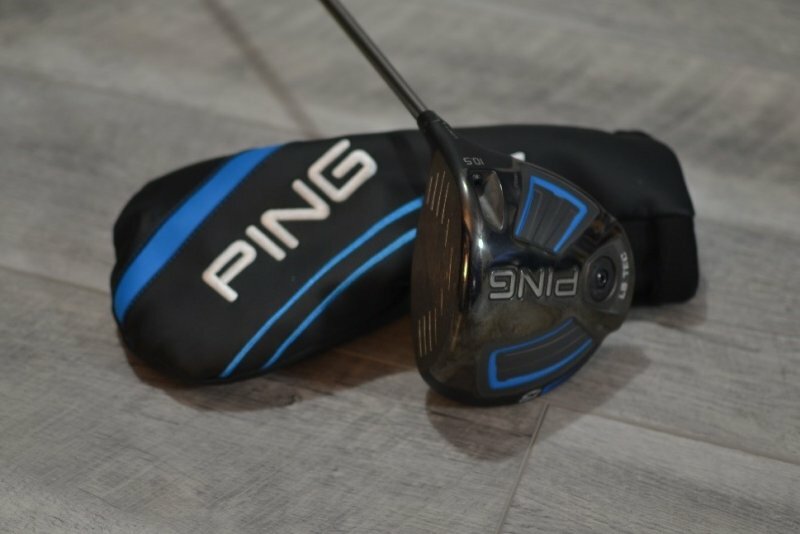 As for my Ping G30, because the driver is what all of really care about today, I chose it because the idea of the low spin version I thought could really suit me as you’ll see once I start talking about my typical miss. The former Ping fitter ordered me an XS shaft after we noticed that my spin rates were extremely high during my iron fitting. the XS certainly brought it down some but I still hit a pretty spinny ball. Unfortunately, unlike many of you, when it comes to shafts and weights, tipping the shaft, etc. I am at a loss. Like I said before, I am not the next Bryson nor am I the technically savvy one when it comes to golf equipment. I can barely tell you the difference between carbon fiber and titanium and left handed and right handed! Which makes me actually think I am PERFECT for this testing opportunity! I am a 4 handicap these days but I don't think that will come down, maybe ever. I think that's about where my game will stay for quite some time if it doesn't go up in 2019. My tempo includes an extremely slow takeaway and fairly smooth transition on all of my clubs EXCEPT the driver. With the driver it really ramps up. This is an old video while swinging in the yard, sorry the weather has been brutal in Tennessee otherwise I would've loved to get some new video with the driver. As you can see, pretty smooth overall but this is not what I would call my driver swing. My driver swing speed is 110mph measured with trackman and as I said before pretty spinny. My typical miss is a high, spinning, way right ball that literally struggles to stay on the golf course. My second miss is the “don't hit that high, way, way right shot again” duck hook. If you could average those, I’m in the middle every time! Because of this my typical strength of my game is scrambling. I am fantastic at the low punch shot, high cut over trees, through trees, etc. I would be a Big Break legend! Watch out Tony Finau and Tommy two gloves! Alright, alright, alright...enough about me and my sad little game. Let’s get serious for a bit and talk about True Golf Fit! I was fortunate enough to also be picked as a beta tester for the website so this opportunity was actually my 2nd chance to get to play within the website. In my personal opinion, the site looks great and is simple to use. It’s modern looking, great colors, has some animation and couple things just immediately jump out at you. The homepage has videos, very clearly defined area to immediately go to the fitting section or you can do some research on what you are getting into. I think it’s great! There isn't an area on the homepage that gets you lost or confused, it is very straight to the point and well defined. Tru Golf Fit was designed for the person that has never been fit, doesn’t know every parameter or data point of his/her golf swing and is looking for a starting point. Well...here I am! 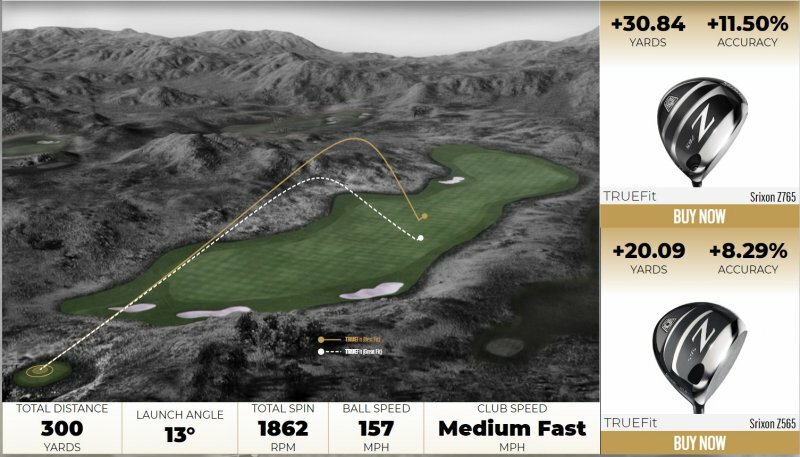 Even though I did have my one “fitting” last year, from the beginning of this website I thought i was the perfect candidate for it but here’s the best part about the site...Whether you have data points on every metric of your swing such as swing speed, angle of attack, tempo, True Golf Fit can guide you to make the selections that you should make. And if you still don't know, there’s Adam in video form to explain it all to you. With all that data I was 2 out of 4. 2 data points that I had “expert” data on and two data points that I was an amateur on. I think this is what makes this site user friendly to everyone and can be useful to any and all types of golfers. After entering all of my data and hitting the big scary finish button, True Golf Fit first spits out your metrics and here are mine and all in all, its pretty accurate! Without question my total spin numbers are much much higher on my misses and probably about 500 RPM higher on good shots but what if I were playing the right shaft and not just a standard factory shaft? Maybe the site knows something I don't! After getting your results it then shows you two options that are best fit to your metrics and shows you a yardage and accuracy increase. Ummm HELLO! Where do I sign up?! (more on that later) +13.14 yards! Nearly 20% more accurate?! That's like 4 trees closer to the fairway for me! people have raved about it and I have considered trying it multiple times but never have so I was very excited to see it. The Mizuno was a different story. Never in a million years would I walk into a pro shop or a retail store and grab the Mizuno DRIVER to swing, irons...that’s a totally different story, but never the driver. But what if? What if the Mizuno driver is something that could immediately go into my bag and change my game for the better? After all, isn’t that's what the site was designed for? It isn’t there to tell you specifically that you should hit the Taylor Made or Callaway. It’s telling you, based on allllll those swings and data points that are hidden somewhere in the cloud, these are the options that will be the best for your swing! personally, I had never (and unfortunately still haven't) hit either one of these clubs so I am so excited to test it out to see if True Golf Fit really can deliver on it’s promise. Your Global Golf U-Try Experience - it's Christmas! And this is where all the fun begins…. I will preface by saying we understood this was not a normal method of ordering the equipment so we had some snags and delays that probably everyone else would never have. After a couple of weeks of back and forth between MGS and GG we thought this opportunity was dead, then alive again, then dead again. Then one day its full speed ahead…”hey guys, what driver are you choosing?” My eyes lit up to the size of basketballs reading that email! I told MGS that I wanted to try the Cobra driver for my tester but To make it feel the most like I was going through the entire process I went to the GG website and found the U-Try Experience. Overall the site is decent to use, point and click, not as intuitive or helpful as the TGF site but useful enough. The first thing I noticed was that the options are configurations were VERY limited. For myself, I was going with the Cobra F8+. Knowing my swing speed and swing style, I know that I am best suited for a XS shaft and at worst, a Stiff shaft. According to the website the Cobra only came in Regular Flex. Looking through some other options many of the choices were like this. If I were a “normal” customer Im not sure what my reaction would be to this. Here I am, just paid $7 to get a recommendation that will change my game forever and TGF gives me two choices and I’m ready to test these out to find out neither one comes in my specs? At that point I would have been back to square 1, back to demoing at the local golf store or picking one out and hoping with all hope lost. This would be a major problem that would have totally turned me away from the GG U-Try Program all together. But i was fortunate…What I'm about to tell you I cannot say with certainty would happen for a normal customer. Maybe if I called GG we could have worked this out, I don't know. Working with and through MGS I was not going to call them directly. Again, as a “normal” customer if GG didn't have my specs on the driver TGF recommended I most likely would have tried it or ordered it from another site instead of calling them to work on things but this is how things worked out for me. After telling MGS that I wanted to test the Cobra I had mentioned that I wanted an XS or S shaft. I get a phone and guess who it is, its A Global Golf rep! The rep was super nice (sorry I don't remember his name) but he informed me that he didn’t have an XS shaft but could put a Red Tie stiff shaft in for me. If I still wanted to do the XS he said we could talk about other driver choices to make sure we found something. I told him the stiff would be great and to send it my way! AWESOME! I immediately got a confirmation email and tracking and it was coming in two days! I thought that was great, albeit, I'm in TN and they are in NC but that’s still very fast in my opinion. I sent an email to Rob and the MGS boys and two days later I receive another confirmation email and tracking info. Within about 3 days I received a stiff shaft that I then installed. The shaft was the same that came installed the first time, Aldila 65g S instead of 60g R flex, but this got me thinking, why was I able to get a stiff shaft now and the website would not give me that option? And what happened to the Red Tie Stiff Shaft option? I still dont know that answer. I think Global still has some kinks to work out. I think they have to decide if they are jumping into this program with both feet or not to really offer a legitimate program that anyone can get what they are looking for. My shipment came with the club, head cover, and tool and was neatly wrapped and protected. It also came with two sheets of paper: One saying thank you for trying the U-try Program and detailing how the program works with returns/exchanges etc and another with instructions on how to get to their site to find instructions if you had a driver that had removable weights or face angle/loft adjustments. This was very helpful. As someone that has rarely messed with loft/face angle/weight changes I was a little nervous to do all of it. They had a 1 minute clip, sortable by brand, on how to make the adjustments. Really helpful in my opinion. The box also contained a return address label if decide to send it back to try something else. Enjoy some amateur photos below! To my disappointment, the weather has not allowed me to get out and hit it as much as I have wanted to. I'm willing to do 32 degrees and bundle up but not willing to do 35 and rain and wind. I really cant wait to hit it and report back if this process was a success! Welcome back to another round of reviews here at MyGolfSpy! Again, we must start by saying thank you very much to the MyGolfSpy peeps for allowing me this opportunity to test! East TN, not typically known for bad weather, decided that it was going to play a huge factor in this testing by limiting the amount of time that I to get out and test this club...unfortunately, we are working on two range sessions and ONE, sadly just one, round of golf. my first range session was a cool, windy day and depending on which way the wind had switched could give real fits to the shots that I was hitting, which for testing purposes, I really liked! The one round of golf I was able to play was a very cool day, frost delay in the morning, (not sure the greens ever thawed out) overcast, not much wind, and a little damp. perfect for ball flight and distance, right?! With that said and the scene being set, let’s start this show! The general shape of the club is appealing to the eye in my opinion. Fairly round, looks like a large/oversized head and has that appearance like you aren't going to be able to miss the clubface. Looking down it feels like it has some depth to it and that from the sole to the crown is a large area. With the crown and the top of the club there is a lot going on. The back half of the club is your new age / modern carbon fiber look, the front portion has a fairly large Cobra logo that works as an alignment aid and from heel to toe you have raised lines for aerodynamics similar to my Ping G30. Essentially three different “pieces” all on the top. With the black model all of this really blends in together and you barely notice the carbon fiber on the back half. 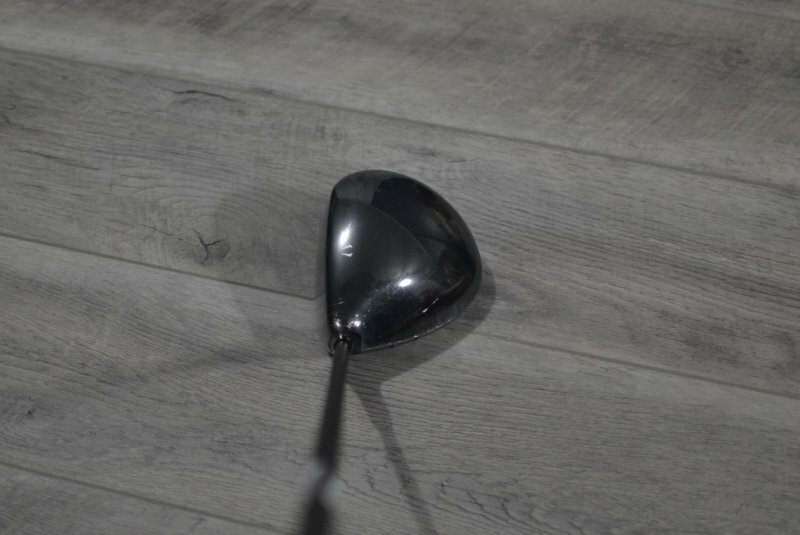 The face of the driver has the CNG milled face design that doesn't draw too much attention but one item that I found appealing is the large circle at the sweet spot. At setup it almost acts as a 2nd alignment aid to know if you are setting up off of center or not. Coming from the Ping G30 its a much different looking club. While both have the raised lines on the crown for the aerodynamics, the Ping has a flat black look, no real alignment aid, and limited lines/grooves on the face. The Ping has a more simplistic design to it while the Cobra, much like its foremost brand ambassador Rickie Fowler, has a little more swag. Some will like the looks of one more than the other, myself, I can enjoy both looks and therefore the Cobra gets a solid scoring from me in the looks category. The very first thing that I noticed when taking the F8+ to the range was the sound it made on my first swing, or lack of real sound. It had a smooth, soft feel like cutting through butter while the sound was just the ball just simply launching off the clubface. There wasn't a loud “tink” or a sound of ripping through a piece of paper, it was a soft sound. No one will hear you hitting this club from 3 holes away. Something that i really noticed on impact was how it felt like the ball stayed on the clubface. It seemed like the when the club and ball met they rode with each other through the swing for about a second in the ball jumped off the face into the air. After a long enough range session I was able to catch a couple off the heel and I still have to give it solid remarks. Any shot that I hit off the heel still felt solid. You obviously noticed that it was hit off the heel as it was able to give you feedback but there was not any ringing, rattling, shaking, vibrating, etc. A little bit of a cut spin but otherwise your hands were still intact. Some drivers feel like you are hitting a baseball with an aluminum bat in 40 degree weather off the handle. Not the Cobra. Any mishits felt forgiving off the clubface and seemed to have a forgiving ball flight and end result. (9 out of 10 points) No perfect score because I wasn't able to feel one off the toe! Because of the lovely Tennessee weather that we had after receiving the club I was only able to get to the range two times. The good news is I was able to hit a lot of shots and get a good feel for what the F8+ could offer! After beating some balls off the cold mats with the irons just to loosen up it was time to bring out the driver! First 10 or so swings were just to get a feel for the club. At this point I had the F8+ set to 9.5 degrees loft with the draw setting. Usually I do not adjust a club and change the settings on it but because I had to change out the shaft after Global sent me a R flex, I decided to set this to a draw setting. The adjusting portion is super easy and Global Golf actually does a great job of offering videos on all their clubs how to properly adjust. Just watch out for that loud click! When I twisted the screw in on the last turn I thought I had snapped the shaft into 2 pieces! The club felt great with every swing. Even with just a stiff flex shaft it doesn't feel whippy or too light at all. I was able to consistently hit my target on the first range session only hitting one really bad miss. My miss is a high block slice that is really just a result of a really bad swing. I get lazy, fall to my back side, dont swing the club and it ends up way right. Even making that one bad swing I was able to quickly tell that with that bac swing, the Cobra was going to be more forgiving for me. Typically I hit this ball 2 holes over or out of the county, the F8+ kept it from being only 30 yards off target rather than 60+. 1 Bonus point for the Cobra! My distance seemed average compared to my ping, hard to tell on the range if I was gaining 5-10 additional yards or not but without question the spin had been reduced. As I said in my intro, the range session was very windy with the majority of the wind coming from left to right and a little bit into me. My typical ball flight is straight or with a minor fade so the ball flight should have been riding with the wind. It was easy to tell that the ball was actually cutting through the wind and fighting against it to not go right. There was a boring, low, fighting trajectory with the Cobra that was really great to see. With this style of ball flight it was easy to tell that the Cobra f8+ had reduced a lot of my spin. I really really wish I was able to get onto a LM to see just how much my spin had reduced from the ping to the Cobra. And if it hasnt...so be it, but it feels like it has and looks like it has and that makes for higher confidence on the tee box! with a few of the mishits that were all off of the toe the ball flight and traj didnt change much. I think this is a very forgiven club. I would say with the heel shots that distance was affected obviously but still very accurate to the target and not extraordinarily penal. My typical range game after warming up with the driverer after warming up is to pick multiple targets, usually two flags, or with my local range a building with a metal roof off in the distance, and hit the ball between the targets while not worrying about distance. I rotate between my different targets forcing me to hit at different directions on the range for 20 shots. This range day I was 14-20 hitting within my target. This is on par or slightly above average for compared to other range sessions with other drivers. I would really have loved to have more play with the Cobra than just one time but that’s all I was able to get. It was black friday, the weather was going to be about 50 degrees for the high (it never got there) and golfers were dying to get to the course. I played at Avalon Golf Course which is one of my favorites but isn't superb for a driver testing. The course is a little tight and on the front 9 you wouldn't really hit driver a ton if you feel a little erratic with the driver as I usually do. BUT! Im there to test the F8+ so I was going to let it fly ALL DAY LONG. At this point i’m still adjusted to 9.5 degrees with a draw face playing the shorter tees, 6300 on this cold, frigid day. First shot of the day a little of the heel but straight, safe, and left with about a 9i into the green. Similar to my range session the driver remained forgiving all day long and excluding a couple of bad swings by me, I would say the F8+ had a solid first showing. As many of you know the Cobra comes standard with the Arcoss Cobra Connect sensor and the free download with the app. This was my first time using it but I really like the idea of it. I would occasionally forget to leave it in my pocket, a requirement in order for the app to know when you’ve hit a shot, and where you hit your next shot from but I was excited to see my post round results. I hit 7 Fairways out of 12 swings (Only measures the first swing from a specific location. i.e. if your in a bunker for 4 shots it cant track all the swings). Missed 3 Left, missed 2 right. What it doesnt tell you is that I made two AWFUL swings where Charles Barkley would’ve laughed. Pulled the head way up and out, swung open with the hips, and was lucky to make contact. My long drive of the day was 281 and my average distance was 260. For the weather that we had, frigid, damp, etc. these numbers are pretty accurate and comparable to my Ping. However, distance is not my issue. My issue is finding the fairway (or really the golf course in general). I was in play all day long minus one shot, good looks at the hole and no real penalizing shots. I didn't spend my entire day mowing down high grass or chasing my balls in the woods with the squirrels. But this is where it really gets fun and another reason why I wish I had a few more good weather days to try the club. After making the turn I hit really solid shots on 12, 13, and 14. All three though drew about 15 yards left of my target, all in play, but all with the same ball flight. All three of these holes have trouble down the left but I was in play. I’m not used to hitting a ball with a draw and if we are being honest, these shots are really taking left hand turns versus drawing or hooking left. Obviously, if that was going to be the consistent shot one could aim more right of the target but that’s not me. So in the middle of 14 fairway I changed the setting on the driver to a neutral face. It’s really simple, loosen the screw, lift the head out, turn the head around the shaft and click it back in. Hole 15 is really straight, a little narrow, really elevated tee box and plays about 320. The first swing with the new setting is where I hit my longest of the day, 281. Left me with just a flip wedge onto the green for an easy par. Hole 17 is a really neat hole. the tee box again is elevated and the tee ball is all carry over water. the green sits on the left side of the view and the fairway/green runs perpendicular to the water. The further you can hit the tee ball the more at the green you can go. If you go directly at the front portion of the green you have to hit it around 275 carry to cover the water and then a easy chip up. i usually aim, because i'm conservative, about 30 yards right of the green to leave myself another flip wedge. That way if I block it i'm hitting a short iron and if I pull it I have enough carry usually to still be on land. I hit another rocket, right on my target, and launched it. easy wedge, easy par. Finally 18 hit another great drive that I was really pleased with. Now im just kicking myself that I didn't leave it neutral to begin with! (35 out of 40 points) I dont think i gained any distance but the forgiveness and accuracy are a great bonus. I’m going with college rules here and for me this driver is an A. I would love to have more sessions with it and I plan on getting fit for a shaft asap to see if spin can be reduced further but as is, i’m pretty happy with it. i believe that TGF was able to hone in with the data that I provided to offer me a product that would reduce my spin rate while keeping my distance or gaining. As I said, i'm not positive that I was able to gain additional distance without getting on a LM and comparing side by side but I do know that my dispersion and spin was down. After making the change from the draw face to neutral, my confidence soared with the last three swings i made (and probably my last swings of 2018). I’m really anxious to get out there in 2019 and check out some shafts and see if I cant become dangerous with the driver again! I just want to thank MyGolfSpy one last time and say i’m a believer in TGF as I think it figured me out correctly. I also want to thank Global Golf for allowing us to test/try out their U-Try Program. Check out my stage 1 review if you want some information on how it worked and some of the kinks they have! Final Score: (90 out of 100 points)!!! My Stage 1 is up! Let me know if you have any questions! Bump for my Stage 1! Like I said, let me know if you want anything tested or if you have any critiques! That's why I moved to the CONUS from islands so I could get better shipping rates and delivery time . But, hey you get to play year round golf, I just had six inches of snow thanks to winter storm Avery...sux! Great start guys, this is going to be an interesting read. It is a shame that Global Golf doesn't have more shaft options for you guys to test. I feel like this is going to be a great read and I'm looking forward to seeing the results. Yes we had some logistical issues to work out, then global had some personnel changes and things kinda took a while to get back on track. But in the end they came up with a good solution and got things moving. GOALIEWALES14: I am curious with you not knowing your exact AOA, did you play around with the numbers to see if the suggestions changed? On a side note, I read recently that while the end cost for the U-Try program is $25, they take the full amount out of your account as a hold until they receive the club back. Kinda disappointing for someone with what seems like less and less disposable income. No I didn't, but of course I was curious since it is on human nature to wonder, right? I wanted to make sure that I used numbers that I could support with data as much as possible. That way it didn't look like I was searching for results that would produce the driver I thought I should be playing. In my opinion this is the biggest review of the year with all of the potential. Great start but bummer about the delay. Do you guys anticipate stage 2 review this year or with delays and now weather will we be waiting until spring? Great forum, great community, and I am sure one of the knowledgeable members has come across this question before (or, can point me in the right direction). I have used the search bar some to pin point this topic to some effect, but haven't come across the answer that satisfies my curiosity. I already know and understand a dynamic fitting and static fitting work best for shaft fitting and it's hard to beat a good (and patient) fitter. My question pertains to online iron shaft fitting/recommendations from most of the shaft manufacturers and/or online fitting services: How relevant is a question regarding iron distance (say, 6i carry) when your current 6i loft and the set you are interested in purchasing is different? I could ,theoretically, hit my 6i 170 yards using a 26* loft but only hit my buddies 6i 155 yards using 29*...these are just relative numbers to express a questionable point... with all other variables being the same (relatively speaking) but loft. My interpretation of the line of questions for iron shaft recommendation is that it is generating results based on flight and dispersion preferences along with swing speed/power/carry distance. However, if my current 6i is 26* and is allowing me to move the ball 170yds down the fairway, how good is the online fitting tool going to be if the new set I am interested in has a more traditional loft to it? Am I totally off base in this line of thinking? Are the manufacturers shaft recommendations useless? Again, I apologize if this has already been discussed ad nauseam. Happy golfing!